It’s not everyday that a Minneapolis creative director gets asked to design the cover of TIME Magazine, but that’s what happened to Brock Davis this week. 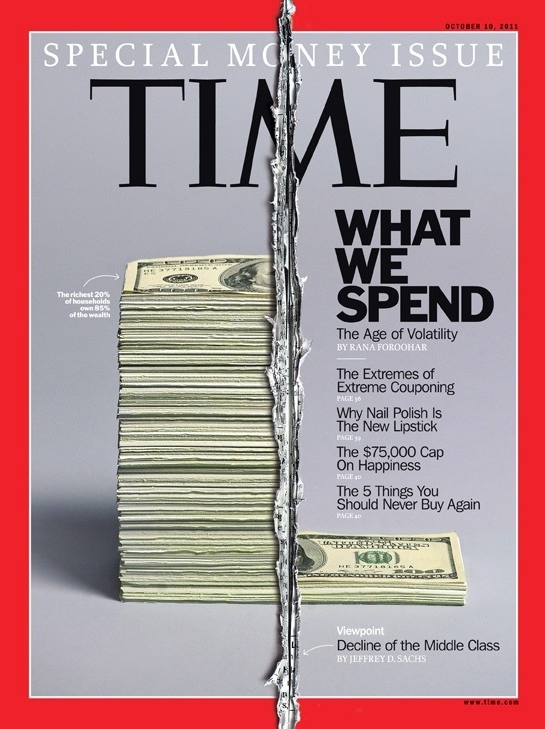 Davis, creative director at local advertising agency Carmichael Lynch, was contacted by TIME to create a cover for the October 10th issue. The magazine will hit newsstands this week. Davis received an email from TIME Magazine asking if he would submit some art for a story about the great division in spending between the upper and middle class in America. He was told that his design might be used for the cover. After hearing this, Davis decided he would only concept an idea that could be used as the cover. He wanted to make a bold statement about the great divide between the two classes. He did so by creating a literal divide down the middle of the cover, cutting through the TIME's iconic red border, logo, and his photograph of a stack of cash. "I wasn't sure if they would like the idea of a big slice ripping through their identity, but thankfully, they didn't mind. In fact, they loved the idea and gave me the go ahead to execute." Davis had only a day to shoot and composite the entire image. In order to shoot a stack of cash, he had to get creative. He cut down 2,500 sheets of copy paper to resemble a stack of hundred dollar bills. Being resourceful he hammered down some of his son's chalk to create a powder and mixed it until the hue matched. Davis then took his wife's makeup brush and dusted the powder over the stack of fake money. Now Davis had the shot he needed and took an X-acto knife and made the slice across the TIME cover. To create the visual depth of thecenter split, he glued multiple magazines together and sliced and frayed their edges and lit them from the side to give it some dimension and shadow. Davis sent the final image and three hours later received an email saying that his design was chosen for the cover. He felt relieved and ecstatic knowing his hard work paid off. Davis is a well-known creative director in the Minneapolis community. He has worked at Carmichael Lynch, for the past eight years, making a name for himself through his award-winning work for clients such as Jack Link’s Beef Jerky and Subaru of America. Davis has helped his agency win numerous awards including the prestigious Cannes Lion award for creative excellence. Davis says “It’s very important to have an established career, because it strengthens your credibility when working on personal projects. Luckily for me, Carmichael Lynch gives me a lot of creative freedom.” Davis has also done some design work on the side for other editorial publications including Wired, Esquire and Fast Company.